Data Sources provide a way to add, remove, and update the data sources that you wish to have access to within the application. Click + Add New to expand the new Data Source form. Note: For different data base connection examples, click Examples in the upper right corner and select the example that best matches your connection type. Fill in the Name, Description, and Database Type. Enter the Connection String. Use the Test Connection button to verify the string. You have the option here for App Manager to automatically create a Configuration Store database for you on your selected database. Click the down arrow on the TEST CONNECTION button and click Test and create database if none exists. Enter the Associated Service URL. If you want the application to authenticate with ArcGIS for Portal, check the box beside Service requires ArcGIS for Portal authorization. Heads Up! If you selected this option, you will need to ensure that TDS has been configured to use Portal for ArcGIS. See the Configure Portal for ArcGIS topic for more details. You will also need to add your ArcGIS for Portal URL in the Application Settings of App Manager. Description - enter a description of the data source. Database Schema/Owner - enter the schema or owner of the database. Spatial Reference ID (SRID) - enter the spatial reference ID (SRID) assigned to the database. Start typing the name of a data source. The list will filter to show matching data sources. The Filter options lets you filter the data source table by Name, Provider, and/or Description. Enter the criteria for the name, provider, and/or description you want filtered into the applicable box. Locate the row for the Data Source you wish to test. Click the test icon pictured above. Heads Up! This will only test the database connection. If the data source you want to test only has the associated service URL, it will fail this test even if that URL is correct. Locate the row for the Data Source you wish to edit and click Edit (pencil icon). Make desired changes to the form input and then use the Test Connection button to verify the string still connects. This feature can be used to import an appropriately configured table (e.g., routeid, from/to measure, biz data, etc.) to be used in the other Transcend applications such as Segment Analyzer. You can import CSV, Excel, or Access tables. Note: In order to use the "data import" functionality the server that TDS is running on must have the proper "data connectivity components" installed. These "data connectivity components" are the drivers that allow external applications (like TDS) to read/consume Microsoft office files (like Excel and Access). If the proper version of these components is not installed on the server, the "Import" button will remain "disabled". Once the "drivers" are installed the "import" button will become "enabled". The following links should be used (preference of top to bottom) to install the necessary drivers: https://www.microsoft.com/en-us/download/details.aspx?id=13255 (must use x64 for 64bit systems) or http://www.microsoft.com/download/en/confirmation.aspx?id=23734 (this is an older 32 bit driver pack that should be used as a last resort if the previous link does not work). Locate the row for the Data Source you to import a table to and click the Import icon. Check the box beside Include Header Row to include the header row of the table. Drag the table (or multiple tables) into the File Import area, or click inside the File Import area and navigate to the table you want to import. Check the table(s) you want to import then click Next. For each table you are importing, in Import Table Name input box enter the table name as you want it displayed. Uncheck any columns you do not want included in the import (all columns are checked by default). For each column in the table you are importing, enter the Import Column Name and Import Column Data Type as you want it to be displayed. Click Next to go to the next table. When finished editing the tables, review your selections and when finished click Import. Tip: If you need to make further edits to the tables and/or columns, click the Edit icon in the Actions column. This feature can be used to export a CSV file containing records from a selected data source. Locate the row for the Data Source you to export and click the Export icon. Select the Version and Table from their respective dropdown lists. 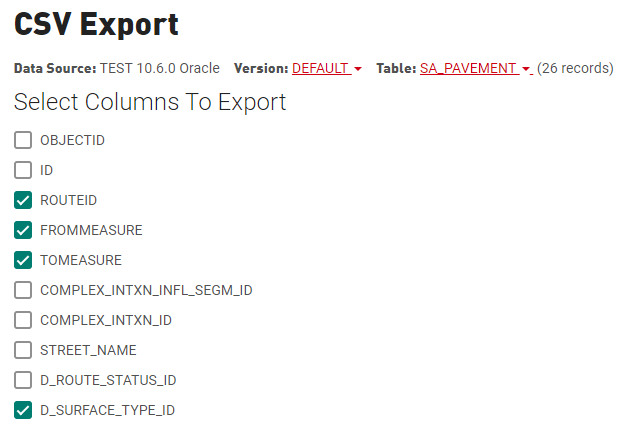 Check any columns you want to include in the export (all columns are unchecked by default). Click Export to start the export of the csv table. Click View Export History in the upper right corner of the Export Data form. Clcik Hide Export History to close the table and return to the Export Data form. Locate the row for the Data Source you wish to delete and click the trashcan icon. Note: If the users of the Data Source(s) will need to make changes to the network and update any tables that they are not the owner of, your database administrator will need to ensure that they have editor privileges so they can make changes to the network and update the tables.